A truck accident or another motor vehicle accident can change your life forever. If you have been injured in an accident, you deserve financial compensation to cover your physical damages, loss of wages, and more. While you can depend upon the insurance company to take care of you, it is important to keep in mind that they are not concerned about your best interests. That is why you want to have a law team that you can trust, such as Williams & Thorson, LLP. Whether your injury is permanent or it is just going to take a long time to recover, having your medical bills, as well as loss of wages and pain and suffering, covered can make all the difference. You need to focus on your healing and recovery and by having some financial compensation you will be able to. Being out from under some of the financial stress can give you the impetus you need to work harder to get your life back. A truck accident will not only affect your life, but also the lives of your family. If you cannot work, it can make an even more noticeable mark on your family, as it will be difficult to give them the same things you did as when you were at full function. No matter what type of injury you have sustained, you want to be sure that you get what you deserve from the insurance company to take care of your family. Williams & Thorson, LLP will fight for you and what you need to get back to your life. Having someone in your corner can make the difference. While the insurance company will try to settle with you for as little money as possible, this will not be in your best interest, as you deserve your lost wages, suffering, and loss of function compensated for as well. 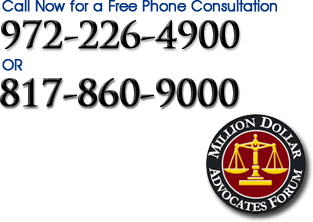 If you are ready to take a step to regain your life, you want to retain a law firm that will fight for you. By contacting Dallas based truck accident lawyers, Williams & Thorson, LLP, you will be able to discuss your situation and determine what compensation you deserve. Call (972) 226-4900 or (817) 860-9000 to discuss your case.